Choose a rectangular or curved bamboo desktop. The curved option allows you to work more easily in your ergonomically-advised neutral reach zone. Choose between a standard rectangular desktop or a curved shape with a center cutout for your UPLIFT 1" Thick Bamboo Desktop. A curve lets you get closer to your monitor and work more easily in your neutral reach zone. The smooth edge is also better for your wrists over long periods of time. Available in standard or dark color options. The UPLIFT Stand Up Desk with 1" Thick Bamboo Top is available in several sizes to fit most workspaces. All desktops are 24" or 30" deep and vary from 42" to 80" wide. Your desk should rise to the level of the work you do and the goals you're trying to accomplish. Now, you can work at the desk Wirecutter has named the "Best Standing Desk." We've made it even sturdier and more adaptable with innovations in safety, functionality, and design. We produced our bamboo desktops with you and the planet in mind. Not only is our carbonized Moso bamboo free of pesticides, fertilizers, dyes, and stains, it’s also a full 1" thick. A thicker desktop means added stability and more surface area around the edge of the desk—to show off the beautiful bamboo aesthetic. Whether you choose the UPLIFT V2 Frame or the UPLIFT V2 Commercial Frame, you're getting the most advanced sit-stand desk available. Click here to learn more about the UPLIFT V2 Frame and the UPLIFT V2 Commercial Frame—and to compare the differences between them. For more desktop options, check out our UPLIFT V2 Standing Desk which consolidates all available 2-leg desk materials. Enjoy your work at an Earth-friendly desktop without compromising. Moso bamboo—technically a species of grass—is one of the fastest growing plants in the world, which makes it extremely sustainable. It’s harder than solid wood and provides a durable work surface that lasts for years. You'll also be delighted by the beauty of the grain patterns on both the top and edges. During the desktop production process, bamboo reeds are carbonized, giving you the full and rich color you see. Every desktop varies, depending on characteristics within the bamboo itself. Our darker shade is made by carbonizing the bamboo a little longer. Choose either a rectangular or curved desktop. Our curved top has an inner edge that carves out room for you to get closer to your work—as well as a shallow bevel to cradle your wrists. Looking for more bamboo desk options? We also offer 120 Degree, Curved Corner, and L-Shaped Standing Desks. For even more information, check out our comprehensive Desktop Brochure. 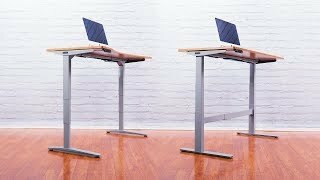 What Sets the UPLIFT V2 Desk Apart? We designed the UPLIFT V2 Desk to exceed expectations. Improving upon our much-loved UPLIFT Desk, we increased its stability, safety, and reliability. The UPLIFT V2 Bamboo Standing Desk is built with contract-grade quality and a customer-centric design that's adaptable to your needs. Should I Get the UPLIFT V2 Frame or UPLIFT V2 Commercial Frame? The UPLIFT V2 Frame has a height range of 25.5" - 51.1" (with a 1" desktop installed). This is our most popular frame: it's remarkably sturdy, surprisingly quiet, and stunningly advanced. And it supports the desk that was selected as the best standing desk by Wirecutter. The UPLIFT V2 Commercial Frame has a height range of 22.6" - 48.7" (with a 1" desktop installed). This frame has a lower starting height, a lower max height, and a larger overall height-adjustment range, compared to the UPLIFT V2 Frame. In addition to meeting ANSI/BIFMA durability standards, it also meets the ANSI/BIFMA G1-2013 height standard, which is required by many of the world's largest companies. Your UPLIFT V2 Frame comes with four dozen independent, patent-pending mounting points to utilize with a growing collection of desk accessories. These holes are discreetly built into the frame, hiding under the desktop and allowing you to maintain a clean, organized look. We have many frame attachments planned for release, including desk extensions, CPU holders, and power strips—which will let you use your desk in a whole new set of ways. We even offer an under-desk hammock, for those afternoon power naps (available now)! Reduce time spent holding down buttons by adding our Advanced Keypad to your desk. Enjoy one-touch adjustments on four programmable memory buttons. Transition to sitting and standing positions quickly and easily, just by selecting your preferred preset. Press a button when you're ready to change work postures, and you'll have the perfect amount of time to move your chair. Advanced safety features, including anti-collision sensitivity and a keypad child lock, let you work with peace of mind. Your desk will only adjust when you want it to—and if it does come into contact with objects or people, it's smart enough to know to stop. The desk's maximum and minimum heights are also adjustable.That means you can set upper and lower height limits, preventing your desktop from knocking into shelves above, or file cabinets below, ever again. An auto-dark LED display helps you maintain focus and reduce distractions in your workspace, dimming the keypad screen 10 seconds after you press a button. We're honored to be named the "Best Standing Desk" by both Wirecutter and Forbes. We're also rated #1 by Wired, Lifehacker, and many others. Join our hundreds of thousands of happy customers, including hundreds of Fortune 500 companies. From the bottom of our hearts, we want to tell you, our customer: thank you for your support. We created UPLIFT Desk after listening to you; it's been our goal since the beginning to help every person and every office build the spaces that let them do their best work. Our team is dedicated to keeping our prices as low as possible, while holding our quality to the highest standards, so that you can create the long-lasting workstation you need. More people are working better and living healthier than ever before, and that's due in large part to you, our customers, and to the support you've given us over the years. Thank you. Provide ample power for your desk and your devices with power options from UPLIFT Desk. We have solutions for every need, from on-desk power grommets, to surge protectors, to clamp-on power units—all to help you stay plugged-in and perfectly powered at all times. Once you're all set at your new workstation, take a look underneath. If you see cords dangling and hanging precariously, act fast. What most people would classify as a common office eyesore can actually cause accidents as you raise and lower your height adjustable desk. We're here to help. UPLIFT Desk offers the most comprehensive wire management solutions in the industry. Sit and stand at your desk knowing that your cords are protected and tucked away, safe from snagging or being pulled out of the wall. Your UPLIFT V2 Bamboo Standing Desk even comes with a wire management tray to get you started. If you're putting together an office of four or more desks, we offer complimentary space planning to help you turn your dreams into reality. Simplify the whole process and let our design team get the ball rolling on your custom office layout. All you have to do is complete four simple steps, and we'll configure your office desk space for free, no strings attached. With your layout, you'll also receive a discounted quote for your order, making your dreams even more affordable to achieve. What is the difference between the bamboo you offer and the bamboo offered by your competitors. While some companies feel okay about offering a 3/4" thick bamboo desktop at a premium price, our bamboo desktops are 1" thick and still beat our competitors' prices. Is this a bamboo veneer? Our bamboo desktops are made from 100% solid, pressed bamboo. You won't find us selling a wood veneer product because we want to offer you a quality item. How will my bamboo desktop hold up over time? Even though bamboo hails from the grass family, it is 40% harder than oak and will provide a strong and durable work surface. At a whopping 1" thick, your bamboo desktop won't sag under the weight of your desktop items even if you decide to go for a 72" wide desk. What color is the bamboo desktop? Our carbonized bamboo desktop can be described as a yellowish-brown honey color. Since each desktop is composed of 100% real bamboo, each will be unique and contain pleasing variations of color. Is this 100% solid bamboo, or if I cut it open will the desktop be hollow inside? You are more than welcome to perform a science experiment and cut open your brand new desktop, but then you wouldn't be able to enjoy your UPLIFT Desk! Instead, just take our word that this is 100% solid bamboo through-and-through that has been pressed together to form a stunning desktop. Is there a protective finish on the bamboo desktop? The bamboo is sealed with a toxin-free clear coat that will help protect your desktop and keep it looking beautiful. Your 1" bamboo desktop is almost as cheap as your laminate tops, what's the catch? Bamboo is a species of grass, and as you know from having to cut your lawn weekly, grass grows at an alarming rate. Therefore the bamboo that is harvested to make our bamboo tops is pretty readily available as compared to our reclaimed or solid wood desktops and we can offer you a beautiful, durable desktop at a low price! Does the bamboo scratch easily? Bamboo is a durable surface, however it is not unscratchable! You will want to care for your desk gently instead of using it as a cutting board in order to ensure years of use. Where do you get your bamboo from? Our bamboo desktops are crafted from Thai and Chinese bamboo. How should I care for my bamboo desk? To keep dust from gathering on your desktop, wipe it down with a microfiber towel. For a deeper clean, all you should need is a towel with warm water and gentle soap. Will my desktop crack if I drill into it to mount my desk accessories? No! Bamboo is a durable material that will hold up well, even when you drill into it to mount your keyboard tray and CPU holder. But please double check that the screws you are using are no longer than 1" thick! We don't want you to accidentally drill through your desktop! Will I be able to assemble this desk by myself? Attaching the frame to the desktop can be done by one person. However, you might want to have a friend's help to turn the desk right-side up after you put it together. Check out our video showing just how easy it will be to assemble your UPLIFT Desk. Can I order a sample of the bamboo desktop? We don't offer sample pieces of the 1" thick bamboo desktop, however you are always welcome to come on down to our Austin showroom to see all of our beautiful desktops in person.